Remodeling your Georgia home’s kitchen can prove to be a very costly endeavor. Despite cost-effective measures, such as those in our previous blog posts, many homeowners come to the realization that different improvements can result in vastly different price points. If you’re here looking for a cost-effective alternative to cabinet replacement, Detail Design & Remodeling is here to serve as your cabinet refacing pros in Atlanta. Our home remodeling contractors are experienced in providing a wide range of services to perfectly match your expectations and your budget. From cabinet resurfacing to custom cabinet builds, renovation services, and more, we’re here and ready to lend a hand. 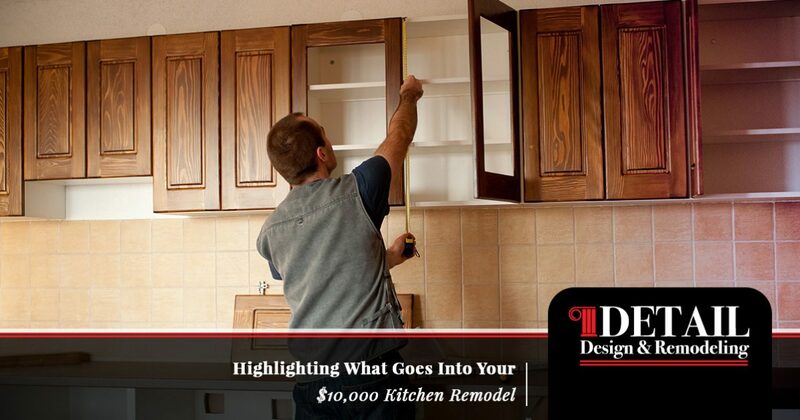 Today, we’ll highlight the basics of what you can expect from a standard $10,000 kitchen remodel. Keep in mind that costs can vary widely based on the materials used, brands, labor, and more. If you’re in need of an estimate for your kitchen upgrades, be sure to fill out our form below for assistance! The goal for many homeowners at this price point is affordability. Ten-thousand dollars sounds like a lot, but when you factor in the materials and labor needed to get the job done, the price can quickly spike. Many people find success attempting DIY improvements. If you are capable, it may prove helpful to open up more funding by rolling up your sleeves and getting to work. Materials of all types can often be found at discounted prices if you are an informed consumer. Be sure to keep an eye out for good deals in the weeks leading up to your project date. Bargain bins at local home improvement stores are a great place to find excess supplies. Yes, your home renovations even include the kitchen sink, too. This fixture is an integral part of any kitchen space and often serves as the centerpiece for your renovations. We recommend pricing out faucets and sink basins to find a cost-effective option that enhances your planned design scheme. Keep in mind, though, that differing sinks may require differing countertop sizes, so be sure you are ready for any changes or improvements. Now could also be an ideal time to install a new backsplash along your sink and walls. Remember that this protective element is meant to be rigid, but the difference in materials can be used to create contrast in your kitchen design. Tile backsplashes are now fairly affordable and can often be simple enough for DIY applications. If applicable, you can update your appliances. This step can often be the hardest to accomplish, as finding appliances that all match seamlessly within a kitchen can be difficult. 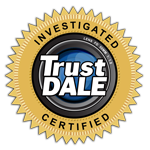 We recommend looking for your appliances ahead of time to be ready in case a good deal comes along. Even within select styles, there are numerous prices for each appliance. If you do not plan on using that expanded freezer space, maybe purchase a smaller refrigerator. Basic toasters can still do their prime objective as well as imported units. Ultimately, investing a healthy portion of your budget into the appliances for your kitchen can result in many advantages. Your kitchen will look nicer, and each device should last longer as well. Once you have determined your total costs, always be mindful of changes that can improve your appliance situation. Your walls and ceilings can be repainted for amazing visual improvements that are not terribly expensive. Many homeowners enjoy the speed and relative ease that comes with painting, as the results are clean, fresh surfaces that can completely transform the look and feel of your kitchen. Now may also be the perfect time to make the jump to more efficient fixtures and appliances. Eco-friendly kitchen appliances do cost a little more up front, but the long-term savings often make this investment well worth the price. The results is long-lasting, environmentally conscious use that saves you money on monthly bills. As always, kitchen cabinet refacing is an affordable solution for those needing to update the look of their current cabinets. Detail Design & Remodeling is here to provide expert cabinet refacing to Atlanta homes, producing quality results that are long-lasting and affordable. The other option is to replace your current cabinets with stock cabinets, a labor-intensive process that can knock your kitchen out of commission for weeks. Keep in mind that many cabinet companies rely on cheap materials that utilize formaldehyde, a harmful agent that can sit in our landfills for years. Simple cabinet refacing services can help to minimize waste. Contact us today to learn more about our custom cabinet services, from cabinet refinishing to full renovations and more!